Early Batch Rahu Kruba Lert Wat TungManTay BE2547. Coconut Shell material. Kruba lert rahu followed the same method as his master Kruba Nangta, where as it comes in pair. First Batch Nur Mai Jantan Rodbot NapranBoon Phor Than Seng Wat Ban Trang BE2558. The material is a 200 years old wood from temple. Bottom insert with Manora powder and soak in Manora oil. Made 1,000 pieces only, serial number 795. First batch rian Kruba Lert Wat TungManTay BE2553. Back with rahu. Copper material made 4,200 pieces only. Phra Kring Naprok Wat KamPraMong BE2533. Blessed by Long Phor Sim Wat ThamPhaPong. Nur Nawa, made 500 pieces only. This piece does not have code at bottom, very rare in market. It comes with original temple box. Phra Kring TriLak Luang Phor Kasem Wat SusanTrairak BE2517. Nur Nawa, Serial Number 243. 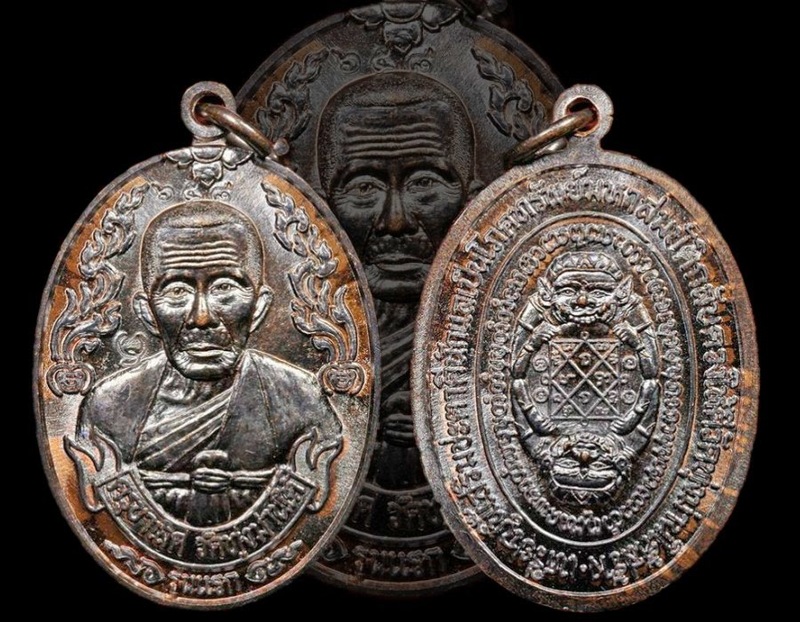 This batch of amulet has Phra Kring and Phra Chaiwat 2 phim, each phim made 1,599 pieces only. It won No2 Placing in Thailand Sukhothai Grand Amulet Competition on 3rd December 2017. Kumantong Roon Bucha Kru Luang Phor Yeam Wat Samngan BE2547. Made less than 2,000 pieces. Chanted for 1 Year. Mixed with powder from Luang Phor Tae 1st Batch Broken Kumanthong Bucha, Phong Plai Kuman, Cemetry Soil. First Batch Roopmuen Luang Phor Waen Sujinno Wat DoiMaePang BE2516. Nur Wahn mixed with Phong tabai Ngern, LP’s hair, soil from 4 Holy Places in India, Holy flower that offer to Phra Buddha. It comes with Pra Muang Authentic certificate. 10. Luang Phor Plod Wat HuaPah Songkhla and others. It won No1 Placing in Thailand ChaengWattana Grand Amulet Competition on 6th September 2015. First Batch Rian (Blok 2) LuangTa Boonnar Wat PaSotThiPol BE2540. Nur Ngern, made 50 pieces only. Back with LuangTa Boonnar’s handwritten yant. Rian Luang Phor Thuad Luang Phor Tim Wat Phra Kao BE2540. Nur Thongdeang. It comes with original temple box.